Blue Corduroy Buckeye | Be the One. Just six years ago, I zipped up my blue corduroy jacket for the first time to attend National FFA Convention. I remember sitting in the nose bleed sections of the arena listening to the national officers speak about our organization and honor its members. My first trip to convention set me on a journey that transformed my life. That trip sparked a light within me to become more involved with FFA, grow as a leader, and become a stronger advocate for agriculture. Even though I didn’t realize it until much later, my first convention trip also led me to make the decision to run for national FFA office. Running for office involved a lot of preparation, growth, and passion. However, my time spent preparing were some of the most influential and transformative months of my life and they led to a moment that will stay alive within my heart forever. 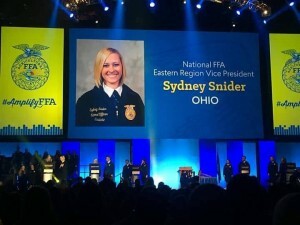 As the final session began at the 88th National FFA Convention, I thought back to the first convention I attended and the passion that grew from that trip. These thoughts and memories allowed my worries and anxiety to leave and truly enjoy what could have been my last convention session in the blue jacket. As the election process began, I was calm and excited to find out who would serve our organization. The music began and nothing could prepare me for what was about to happen. Hearing “Ohio” called was one of the most surreal moments I’ve ever experienced. In an instant, everything seemed to slow down as I (not so gracefully) ran to the convention stage. Out of breath and in shock I could only hear the roar of the crowd and my heart beat loudly as my teammates and I gathered together for the first time. This year, I am excited to serve an organization that has helped me discover countless values, skills, and passions. As a national FFA officer, I will spend the next year traveling around the country interacting with FFA members, advisors, sponsors, and supporters. I am proud to represent the Ohio FFA Association and The Ohio State University at the national level. As I am knee deep in training and preparation for the year, I am feeling especially grateful for the support and encouragement of those who have helped me along this journey. I look forward to bringing a piece of that, a piece of Ohio, everywhere I go this year. Posted by glass229 at 6:41pm September 14, 2016 Posted in Student Life, Uncategorized. Bookmark the permalink.